We continually read and address the ideas and concerns you put into the CFA Suggestion Box that’s lived on the front counter since 2015. Here are the questions and comments that you’ve had for us this summer! A couple of suggestions related to the summer weather, asking for air conditioning or ceiling fans. We definitely get it. Summer is hot. Unfortunately, industrial air-conditioning and fans can be very expensive. So… we try to appreciate the weather. But we’ll keep looking into options in case they become financially feasible. A few comments related to member behavior and noted that member behavior was disrespectful in some situations. We do everything we can to make CFA the best place it can be for our members. But you affect that too! Please respect your coaches, your fellow members, and the facility. And to address one concern specifically: informally, we’ve allowed members who are doing Open Gym to jump in for part of a class. But we understand that other members can find that disruptive. So we’ll keep an eye on that to see if the policy needs to change. Offer decals or stickers with the whole CFA logo, not just the symbol. Have a convex mirror on the corner of the building to prevent collisions when running. These are great ideas. We’re looking into them! Have a different coach program the workout every Friday. The programming at CFA is done with progress in mind, to offer members the most balanced, effective training possible, while taking into account that members have different schedules – some take weekends off, some can only come on certain days, etc. To have unrelated programming once a week wouldn’t be helpful for that. Do you feel like it’s been a while since you’ve done a certain lift? Do you want more burpees? * Please tell us! Your feedback will help keep your training improving. *Trick question. Nobody wants more burpees. 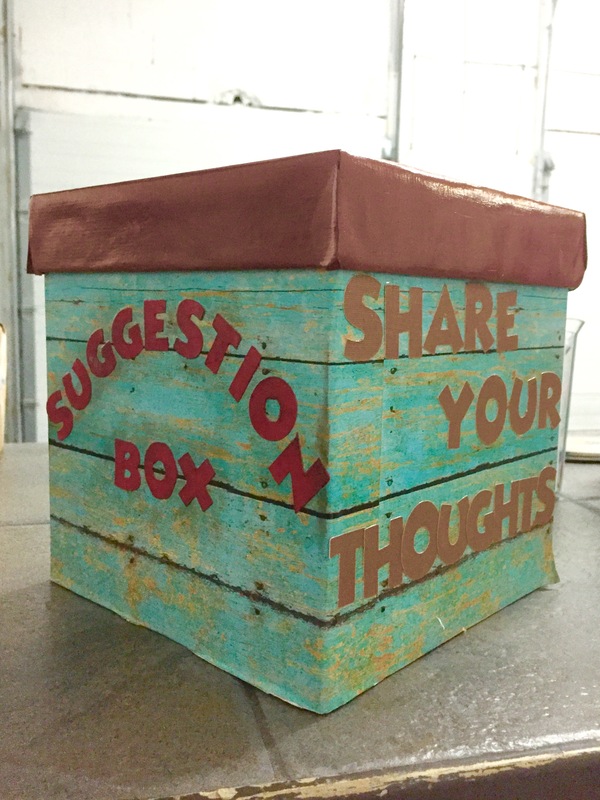 The Suggestion Box is here for you – but, more importantly, so are Allie, Caps, JZ, Ryan and the rest of your coaches. Please keep bringing us your opinions and ideas on how to make CFA better!